First: I am very aware of the fact that talking to somebody with impaired hearing is very tricky for those with normal hearing. This kind of disability is difficult to notice. When I meet sombody under “controlled conditions”, I mention my hearing aid right after we have been introduced. Unfortunately, this important detail is forgotten rather quickly and needs many reminders. Fact #1: When I am in a loud enviroment with background noise and people talking (e.g. when I am sitting in a bus: droning of the engine, a group of students is talking), I may not be aware that I am adressed. In this cachophony of sounds, it is difficult for me to recognise speech. It may even not react to my name – it just doesn’t reach my mind. Best solution: Make eye contact and signal that it is me you want to talk to. Stand where I can easily see you, I read lips to support my hearing. Second best solution: A light touch. This will also alert me to you. Second best because I startle easily. I know that there a many things I don’t notice. Being touched means, something (maybe something dangerous) is very near. Fact #2: When I keep saying “I didn’t understand that”, I refer to the clearness, not the volume level of speech. Best solution: Try to speak more clearly. Sometimes it’s the little things, e.g. a full beard that keeps me from reading lips. DO.NOT.YELL! Like any other person, I do not enjoy to be yelled at. And if the problem is in the clearness of your speech, speaking louder won’t help. Fact #3: My intelligence has not been impacted by my poor hearing. Using “simple” ore “baby language” insults me and is uncalled for. Best solution: Speak as normal as possible. Fact #4: Verbal communication is very exhausting for me. I may be used to it, I may be able to compensate a lot, but at some point I am at the end of my rope. Best solution: Accept if I don’t stay at a party until morning. Accept when I prefer texting or writing an email to talking on the phone, because it is easier. Accept that I need lots of quiet time to recharge in which I don’t want to talk and listen. Fact #5: It’s ok to have a laugh about misunderstandings! I don’t mind, in fact, I’ll be the first to find it funny! And if I am hanging off your every word, it is because I read your lips. You have my undivided attention. Some teachers in school thought I was making fun of them, but I am just very thankful for every word I understand. Participating in the world of normal hearing people is very hard for somebody who has limited or no sense of hearing. A setting without background noises, with lots of light to make lip reading easier, may not be romantic, but it helps communication. A little thoughtfulness is all I ask for, it helps so much. After consulting with my hearing aid acoustician yesterday and my ENT specialist in Cologne (see pictures above) today, it is obvious that my ear still is slightly infected. It still needs lots of hearing-aid-free time, and I was given an ointment to use every night. A really stubborn thing, but quite common among hearing aid wearers. My hearing aid acoustician mentioned a very interesting subject yesterday: Speech intelligibility. Hearing is one thing, understanding is someting completely different. Understanding takes place in the brain, and it does not come naturally. It can be learned and unlearned, so a hearing aid should be used as soon as possible when necessary. But: The brain has to get used to it. Everything sounds different with a hearing aid, louder, maybe just unpleasantly artificial. This is why an elderly person, whose hearing got worse over the last years, does object to wearing a hearing aid at first. Of course, a younger person has the same problem, but will adapt quicker. Training is the only solution to this problem. And: Wearing the hearing aid often and for as long as possible will shorten the process. The hearing aid acoustician will help by adjusting the settings of the hearing aid. Hearing is a very individual thing, it is absolutely normal that the settings has to be changed in the beginning. So do not hesistate to ask your acoustician for help, they are used to it and like to help! One thing is important to me. People, who are profoundly or almost deaf often are pressured into getting cochlear hearing implants by doctors or authorities, so they can join the hearing community. I think this is a double-edged sword. Deaf people, espeacially those who are used to this from infancy, often don’t miss hearing and are quite happy. Normal hearing people may not be able to understand this, but this is the way it is. Even I, who lives with hearing people around me all the time, am absolutely convinced that there are many crueler things that could happen to me, than becoming deaf. And the most important reason not to have an CI in my left, deaf ear is: There is no guarantee that I will understand speech after this. There is the possibility that getting a CI results in hearing lots of noise, without recognizing speech. In every case, getting used to living with CI takes months, if not years – without knowing how it will turn out. So if you meet a person who decided for/against CI, be aware of the fact that this no easy decision to make. So I gladly put my hearing aid in my ear today after two days of healing, and was disappointed when my hearing still wasn’t as good as I remembered it to be. Of course it’s the weekend, and I can’t reach my ENT or hearing-aid acoustician *deep sigh*. c) the hearing aid still fits my ear canal (the ear changes its shape even in adults). b) if my hearing got worse. An audiogram takes maybe 15 minutes and can easily be compared with earlier tests. So far, so good. But I have to admit I feel frustrated, because I really thought everything would be back to normal today. In my post 0 and 40: Risks and side-effects, Part 1 I described a situation that causes additional stress, but hopefully it will be over in a few days. Some side effects of hearing loss, however, are permanent. Tinnitus. In my case it’s a constant rushing, that becomes louder when I am stressed or in a quiet enviroment. But I learnt to deal with it when I was a little girl and turn it into music, then it isn’t so bad. I know other people have a hard time finding out how to live with it. However, this continuous noise in the back of my head can be a problem when I really try to focus on something (e.g. what another person is saying). 1.) As every other person, I am expected to reach certain standards, but my limitations often are ignored or belittled. This is, of course, especially a problem were work is concerned, but this will be another post. Long story short: Be beware of burnout and depressive exhaustion. 2.) Poor hearing means to be cut off from most people, because they communicate through speaking. Whisper in my ear? Sorry, I can’t understand. Loud music, like concerts or discotheque? I’ll have to pass, I don’t want to jeopardize what is left of my hearing. Go swimming? I got nasty fungal infection in my right ear after my last try, so I am reluctant about that. Meeting at a restaurant or a bar to talk? I hope there’s not to much background noise, because otherwise understanding you is really hard for me. Going to the movies? Depends. Too loud is as stressful for me as too low. And when the movie has been translated, so the language I hear differs from the language the actors speak, I can’t even help myself with lip reading. Many social gatherings are a real challenge for me. And if you can’t participate in such events, you become an outcast. I am more mindful of my abilities today, but after three hours of talking in a grop (e.g. family), I am just drained and need rest. I would like to stay longer, I would like to enjoy it more often. Sometimes I can’t help feeling bitter. It is a fine line between what I can do and “Damn, that was too much!”. 3.) Invisible disabilities like deafness often are overlooked by society. This is understandable, but pointing it out to those around you again and again is a permanent struggle. Bystanders often can’t judge if a situation is easy to handle (in my case: a dialogue in a quiet setting without disturbing noises) or too much (when I try to follow a presentation and everybody around me is talking). This explanation is a personal one and by no means representative. What I want to say is, that living with a disability is a hurdle race, where others run on a nice, even running track: You just can’t compare those two. Everybody living with a disability knows these bad times when your disability causes extra trouble. In my case this means infections of the ear canal and/or middle ear. A hearing aid brings bacteria in the ear and irritates the skin. The skin inside the ear doesn’t get thicker with time, like the skin on the feet does when it reacts to ill-fitting shoes. It remains sensitive. The reason why I went to the ENT doctor today was, that I have had trouble hearing the days prior. What he found was another bad infection. My doctor has a very strict method of dealing with this: A strip of gauze that is soaked with antibiotic ear drops is put deeply into the ear canal and stays there for two days. I had to learn it the hard way, that this is the only possibility to completely get rid of a really nasty infection. In the past I tried antibiotic ointments that allowed me to continue wearing my hearing aid, because I am really dependent on it! I got to know my ENT in the year 2000. It was pure luck, he was the locum doctor during the summer vacation of my regular ENT. Back then, I suffered from a very persistent ear infection that wouldn’t go away. We tried every fungal and antibiotic ointment, nothing helped (a few weeks later I was diagnosed with Melanoma, maybe my body wasn’t strong enough to deal with this at that point). What I really like about this doctor is his honesty. So he told me straight away, that my ear wouldn’t heal if I didn’t stop putting the hearing aid in it for a few days. I didn’t like this, because not being able to use my hearing aid meant not being able to work. Finally I agreed, and voila: The infection was gone a few days later and never came back. As Paracelsus said: “He who heals is right.” Years later, this doctor helped me to get my severly disabled ID card, what was overdue at this point. And he never tried to push me into having an cochlea implant in my left ear. He mentioned it, I told him why this isn’t for me, and this was it. I rarely have to go see him, one or twice a year, so it’s worth the long way. So I won’t use my hearing aid until Saturday morning. For this time, I will be completely deaf, because the gauze in my ear absorbs all residual hearing. First, I let all the important people know what happened, so they don’t try to call me. Mobile phones and smartphones are really helpful! The normal hearing people pitied me a lot. They think I can’t do anything right now, and that I am not able to participate in life. They’re wrong. Many years of poor hearing made my brain find other ways of orientation. I am able to find my way in traffic by watching everything around me very closely. Of course I don’t hear cars honking, or the siren of fire trucks. But what about the people who deliberately chose to ignore these sounds by hearing loud music from their car radios? I am not allowed to drive a car without a hearing aid, though, it’s stated in my driving licence. Before I got on the train back home, I bought a coffee to go. I managed fairly well, even without hearing anything. My speach will not suffer in this short time without hearing, and I am capable of lip reading. When the barista asked for my name (she wrote it on the paper cup), I was surprised but I got it right on the first try. I know I can’t do lip reading for hours right now, it’s too stressful because I am not used to it being my only way of listening, but it is enough for the moment. For instance, I would be fine with travelling by bus and doing the grocery shopping. It doesn’t add to my anxiety, because I am very aware of the many things I don’t notice even using my hearing aid. Of course I am looking forward to Saturday and taking advantage of my hearing aid again. Communication with my loved ones will be easy, as will be watching TV and listening to music. As long it’s temporary, I can tolerate this situation. If deafness becomes a permanent condition, this will be hard to adjust to. But even then, my world will not end. I read a german post yesterday in which a foster mother tells about her struggle finding a place in kindergarten for a child with special needs. It reminds me of the challenges my family faced in the 1970s. Today, children in Germany are monitored closely to detect problems as early as possible. Back then, we saw our pediatrician for vaccinations and when we were ill. In my case, nobody noticed that I was dear on the left ear. Delayed speech development was explained with my premature birth. After a infection of my right middle ear in my last year of kindergarten, my mother noticed that something was seriously wrong with my hearing, and that I didn’t react when she called me. This started an odyssey. I remember the following tests very clearly. Doctors and hearing aids technicans were not prepared to deal with children. My mother was not allowed to be in the same room with me during the tests, even though I made it clear through crying and screaming that I didn’t want her to leave. Nobody even tried to tell me what was going on. I was a clever child, I would have understood an explanation suitable for children. I was expected to behave compliant and calm, as an adult would do. Of course I couldn’t do that, and many unpleasant experiences piled up. I became anxious and shy and regressed. My mother had to be near me all the time. It was a hard time for my mother, too. She just could stand there and watch everything. Finally the results came in. Not only had the middle ear infection affected the hearing in the right ear, but I apparently was completely deaf in the right ear, too. This, too, was explained with my premature birth. A hearing aid was adjusted for my right ear, and we were sent our way. A hearing aid technican told me a few years ago, that some of her colleagues now have special training to treat children. I hope there are many of them. Then I was tested for school readiness. I refused to participate. I knew the answer to all of the questions, but I was way too nervous. I kept squirming around on the chair and wanted to leave the room, because I knew my mother waited outside. At this time, children were given the oppurtunity to have a special year of preschool between kindergarten and school. This really saved me. We were a small group of ten children, all with special needs. We had a teacher and an assistant teacher. It was a lot like school, we learned to sit at our desk and started writing and counting. I slowly got used to my hearing aid. Then I started “really” going to school, at a special school for deaf children. Teachers used sign language and spoken language simultaneously. All of my classmates were using sign language. I didn’t know anything about sign language, so I wasn’t able to really talk to them. At this point, I could read fluently and was well into learning how to write. The classes bored me. What I didn’t know then, pupils at this school were given two years to learn what was thaught in one year at the normal primary schools. The teachers quickly noticed I was bored, and told my parents I would be better off at a regular primary school. And my parents somehow made it happen. I was very glad because many of my new classmates were living in my neighborhood, and I knew them. It took me some time to catch up with them, but that was easy. To orient myself in a large group of 25 people was hard, especially during the breaks or physical education with lots of noise. Meanwhile, my speach had been affected by my poor hearing. I slurred words and it was difficult to understand what I said. I started logotherapy. Hopefully it is more fun for children today. We were shown posters with many objects drawn on them, the therapist pointed at one of those objects and we had to say what it was. Once again, no explanations what we were doing, or why. This training was continued at home, we had a book with pictures in it and I had to say what was in those pictures. The practice payed off, though, I learned to speak quite well. I still slurr the “S”-sounds, my husbands says it sounds like lisping. But apart from that, my pronounciation is similar to that of a person with normal hearing. So far, so good? I am aware of the fact that I was very lucky. b) my pronounciation was good, and I wasn’t picked on by classmates. c) being a techer himself, he was able to talk with other teachers and principals eye to eye. This gave me opportunities others don’t have. My parents motto was: Demand and encourage. I was expected to adapt completely to the hearing world. This was no problem as my intelligence was concerned, but it took years for me to admit that some things are, and always will be, impossible for me. This is not my fault, and I can’t change it, either. Period. What made our situation even more difficult was the fact that we didn’t know any families facing the same problems, or advice centres. And we didn’t have something like the internet back then. We fought this battle on our own, as well as we could. This is the first part of a series dealing with my hearing impairment. “0 and 40” refers to my residual hearing, 0% on the left, 40% on the right ear. I have been called “stupid” (not true) and “deaf” (not completely, thanks) by people with normal hearing. I think, many facts about living with impaired hearing are not as well-known as they should be. Poor hearing often is associated with old age, that’s not the whole truth either. It’s important to keep in mind that there is not ONE, but MANY ways to deal with deafness. Everybody has to find his/her own. In my case, the hearing of high frequencies is drastically impaired. That affects comprehension of speech and noticing high sounds as ringing telephones, doorbells or alarm clocks. When I was a child, my parents tried every kind of alarm clock. Everybody would be wide awake, except me. So for the next years I was dependent on somebody waking me in the morning. 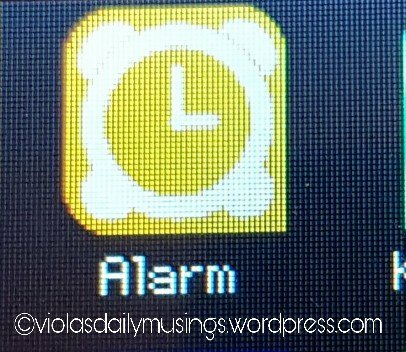 Then we found out accidentally, that music (music contains more deep frequencies than the beeping sound of a normal alarm clock) from a radio alarm clock would wake me. I was so thrilled, because that meant a piece more of independence! That worked well until a few years ago my hearing worsened (that can happen in your mid forties). I do not respond well to light alarm clocks, so I had to look for something that works with shocks. And it had to be portable, in case I don’t sleep in my bed. Our first try was a dual radio alarm clock with an alarm shock bracelet. Both alarms could be set to beeping, beeping and activating the bracelet, or just activating the bracelet. The bracelet had three settings. It worked well for me, and my husband still uses this alarm clock in beeping mode. But there was one problem: The bracelet had no charging indicator, so I couldn’t be sure if there was enough power left to wake me in the morning. That led to unnecessary charging and/or worrying if the bracelet would go of in the morning. For me, a cheap smartwatch works best. It’s silent vibration-based alarm clock is strong enough to wake me, and it has a charging indicator. This is not for everyone, i.e. when light impulses work better or no smartphone is around. But I was pleasantly surprised how many alternatives to the classic alarm clock can be found.